On average, people are diagnosed with kidney cancer at around age 64. It’s rarely found in people younger than age 45. Generally, our lifetime risk for developing cancer in the kidney is about 1 in 63 (1.6%)1. This risk is higher in men than in women. The terms “tumor,” “mass,” or “lesion” are used to describe an abnormal growth in the kidney. Tumors can be benign (non-cancerous) or malignant (cancerous). 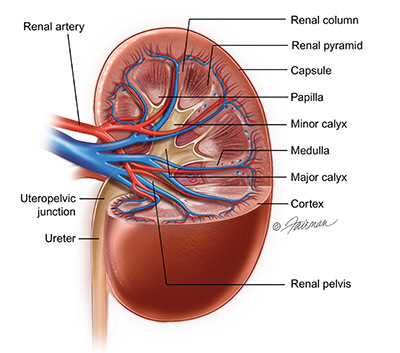 A fluid-filled sac, called a cyst, is the most common growth found in a kidney. Cysts are mostly not cancerous. Solid kidney tumors can be benign, but most often are found to be cancer. 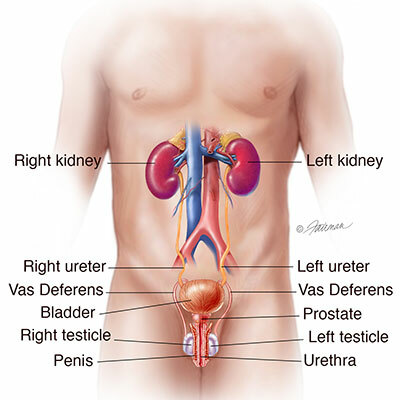 Kidney cancer is one of the top 10 most common cancers diagnosed in the United States. In 2017, about 63,990 people will be diagnosed. About 14,000 people will die from this disease. Of the people who are diagnosed early (stage I or II cancer), 75-80% will survive. Healthy kidneys work around the clock to clean our blood. 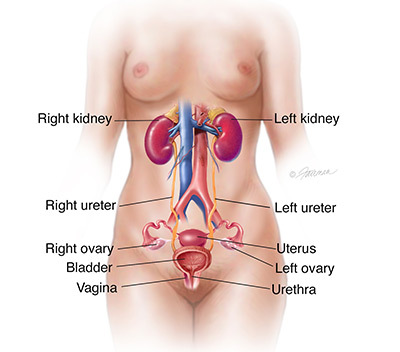 The kidneys look like 2 bean-shaped organs. They are found near the middle of the back below the rib cage. They are surrounded by a protective sac called the Gerota’s fascia and a layer of fat. 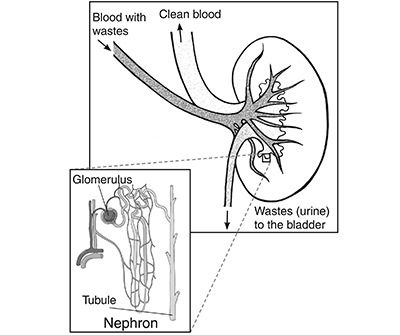 The renal artery brings “dirty” blood into the kidney. The renal vein takes clean blood out to the heart.